Join us for this unique journey along one of the most dramatic mainlines in the world, with a pair of steam locomotives double-heading. Starting from Inverness, we being by tackleing the steep 23 mile climb to Slochd Summit, crossing over the spectacular Culloden & Findhorn Viaducts before descending the towards Aviemore. After our water stop we have a another long climb through the Scottish Highlands through Dalwhinne towards Druimuachdar (Drumochter) Pass, the highest point of the National Rail network at 1,484 feet. Once over the top we drop down hill, taking in more spectacular scenery towards Pitlochry & after a final blast up the short sharp gradients of Dunkeld Bank, our doubleheader arrives into our destination, Perth. 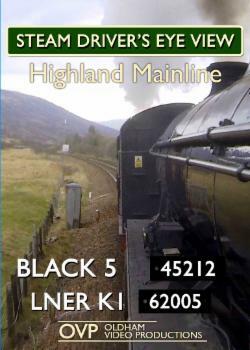 We also feature bonus material of the Northbound climbs to Drumimuachdar, as well as the Slochd. With live sound recorded from the locomotives, we bring the action right to you. We also bring a rich mixture of mulitple camera views, recorded from the: train, footplate, and lineside providing you with one of the most amazing railway journeys recorded with Steam. This program also features commentary, titles & locations.